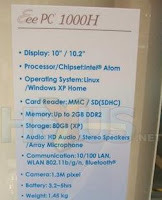 We already knew that the Asus Eee PC 1000 would feature a larger display than the Eee PC 701 or Eee PC 900/901. But Hexus has found evidence that the latest Eee PC model will also sport 80GB of storage space. It’s not clear if that means the Eee PC 1000 will use a hard drive instead of solid state memory. My money’s on yes, but Hexus speculates that the computer could just be using a higher capacity SSD, which means it will likely cost quite a bit more than the smaller Eee PC models. I suppose there will be 2 flavors – the XP model with 80GB HDD and the Linux model with and SSD of lower capacity (hopefully still bigger than 900/9001).